Issues of Gelanggang Film in July 1961 (left) and Feb 1962 (right). Magazines supporting the Singaporean film industry have existed since 1940, when the first movie studio was developed in the colonial port. 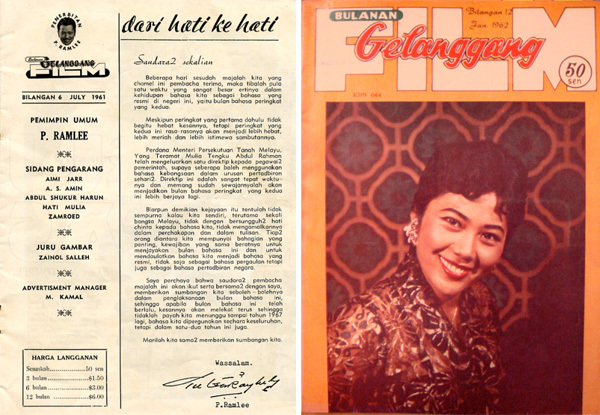 The first local film magazine – Film Melayu (Malay Film) – appeared in 1941. It was published through an alliance between Shaw Brothers, which had built a facility on Jalan Ampas to produce local language films, and Malay journalists who saw in film the potential to advance a modern and independent nation. As long as their films were promoted in the magazine’s pages, Shaw Brothers gave journalists free reign to publish any other content. The result was a monthly magazine that contained summaries of the films produced during the brief period prior to the Japanese Occupation, as well as short stories and nationalistic essays. After an interruption due to the Japanese Occupation, film production – and magazines that promoted it – returned to Singapore. While there were several companies that attempted to produce films, Shaw Brothers’ Malay Film Productions and Cathay Keris had dominated the market by the mid-1950s. Among the most interesting magazines are those related to the dominant film personality of the period, P. Ramlee. Born and raised in Penang, P. Ramlee arrived in Singapore in the late 1940s and quickly became a film star, a position that he parlayed into directing and writing films by the mid-1950s. Ramlee was able to combine charisma with modern, nationalistic understandings of a society facing issues such as decolonization. This made him one of the most interesting, and enduring, figures of the era. The films that he directed remain popular among fans as pure entertainment well into the twenty-first century , while academics have found his vision of the individual who can overcome traditions to become a citizen in an independent, modern nation to be equally compelling. As the biggest star of the day, Ramlee had his own fan magazine, Bintang (Star), which was first published in 1953. In addition to the usual star-oriented articles and news, Bintang followed the approach that Film Melayu had set some fifteen years earlier. Alongside fluffy pieces on film premieres that Ramlee attended or his favourite places to eat, appeared articles, poems and essays written by some of the most important post-War writers of Malay literature. These include Abdullah Hussain and Asraf, who were members of the editorial staff. Ramlee allowed these writers to run the magazine in his name, resulting in the presence of strident essays calling for readers to question their colonial mentality or promoting a vision of an independent Malaya. Bintang lasted for several years, but eventually closed due to changing publication laws and difficulties with printing. In 1958, a new magazine replacing Bintang appeared on magazine stands throughout Singapore and Malaya. This new magazine was Gelanggang Film (Film Arena), and it was officially under the editorship of P. Ramlee. It was essentially a continuation of Bintang, but even more popular. At its height of its popularity, Gelanggang Film was published three times a month. Much like its predecessor, Gelanggang Film contained much more than fluff pieces on the important filmmakers of the day. The editors and writers were not afraid to criticize local film, often pointing out difficulties that the industry faced with regard to funding or storytelling. This resulted in brutal assessments of the role of film in society. For example, the August 1962 issue of Gelanggang Film featured a piece on Hamzah. A novelist and one of the founders of the Malay literature society ASAS-50 (an acronym for ‘Generation of Writers of the 1950s’), Hamzah broke away from the group’s battle cry of ‘Art for Society’, finding the phrase to be too polemical. He eventually became an important screenwriter for Cathay Keris. The article implored him to write screenplays that would help revive the film industry in Singapore. Three months later, another article appeared comparing the works of the two leading Malay film directors of the time – Jamil Sulong and Hussein Hanif – urging them to be more diverse in the genre of films they directed. It had a particularly strong plea to focus on stories taking place in the present, as such films would help the modern viewer better understand their place in a quickly changing society. Many of these forces converged in another article published in the August 19, 1962 issue of Gelanggang Film, criticizing the release of the Cathay Keris’ film Badang. Based on a traditional tale from the region, Badang focuses on a common fisherman who magically gains super strength, which he then uses to defend Singapore from outside forces. It featured many famous talents – M. Amin, a nationalistic author and filmmaker, wrote the screenplay; Roomai Noor, long an advocate for a local nationalistic voice in film, wrote additional dialogue and directed the film; and Zubir Said, the composer of the Singapore national anthem, composed the score. However, the film was a nationalistic failure. Supposedly, members of the audience laughed at serious scenes, and the film became a point of mockery throughout Singapore. Much of the blame for the disaster for Badang was directed – unfairly – at the star of the film, Wahid Satay. A mainstay of Cathay Keris films of the late 1950s and early 1960s, Wahid was a comedian. To have him play a heroic figure, known for his strength, was too much for many promoters of local film, and these feelings were conveyed in an article Ramli Ismail wrote in Gelanggang Film titled “Kenapa Saya Tidak Suka Wahid Satay” (Why I do not like Wahid Satay). In the piece, Ramli pointedly criticized the actor as simply a buffoon (pelawak) who mocked people (mengkarton orang) and provided little insight into the human condition with his exaggerated expressions and movements. He also accused the actor of gaining favour with directors and the studio in order to get his parts. This harsh assessment would hold true for the entire film industry in Singapore by the mid-1960s. Films became rote, low budget productions, as most of the stars, writers and directors migrated to Kuala Lumpur. Television replaced film as the main form of entertainment. With the decline in filmmaking in Singapore (and Malaysia), film magazines were also closed down due to declining interest among readers. It was the end of an era in which the leading nationalistic writers embraced the opportunity to direct their gaze at the silver screen, and criticize what they saw. Badang. By S Roomai Noor and M Amin. Dir. S Roomai Noor. Perf. Wahid Satay and Zainol Gemok. Cathay Keris Films. 1962. Timothy P. Barnard is an Associate Professor in the Department of History at the National University of Singapore. His main area of research is on the cultural and environmental history of Southeast Asia, with particular attention on the Malay world.